Hidden in the bylanes of Marol and spanning 6,000 sq. ft., Maker’s Asylum has four fully functional labs that let’s you invent and innovate. Makers working in Maker’s Asylum. 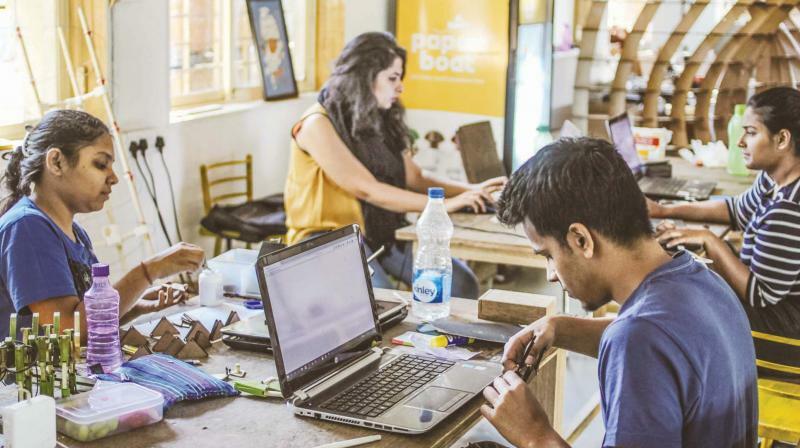 A community-based co-working space, the Maker's Asylum has successfully been propagating maker culture in the city since 2013. It gives people bitten by the creativity bug a space to master their talents in woodworking, electronics, 3D printing and laser cutting. The Asylum, as its regulars call it, started out as a non-profit foundation. It all began when Vaibhav got together eight people to fix furniture that had become damaged due to the falling of the ceiling of his then-office. What started out as some recreational repair activity, gave impetus to their hidden love for carpentry. Today, the Asylum operates as a start-up that not only provides people with the space and tools for their creative pursuits but also conducts regular workshops to equip people of all ages and backgrounds with skills and resources. If you happen to pay it a visit, you’ll find the Asylum teeming with artists, designers and engineers working on their creations. The décor, all of which has been hand-made by the makers themselves, includes a leather world map, a wall hanging made of old vinyl records, a wooden lamp and an electric bike. You may also run into former software engineer Viren Vaz, who joined the Asylum to pursue his interest in woodwork not knowing that he'd soon be quitting his job to follow his passion. Today, he's a freelance woodworking instructor that conducts workshops under the name V for Wood and the maker of the wooden tables at the Asylum. “It became my second home. I would take the day off work at the drop of a hat to be here. I built some tables - the first pieces of furniture that I made - and it was quite a feat to make something big and sturdy, that too, without using any nails! This is a place where people understand you and let you be who you are,” Viren says.